The intersection of public health and social work has been evident since the days of Chicago's Hull House and New York's settlement houses. A major impetus in the development of the settlement houses is the same as that which now drives the increased need for and attention to public health social work—recognition of the social determinants of health. Then, as now, health disparities and lack of access to health care due to economic inequality were critical causes of illness and mortality. As our cover story describes, the United States is particularly primed for a surge of interest in public health social work as its health care system is undergoing a transformation with the implementation of the Affordable Care Act (ACA). Ever-increasing health care costs had marginalized many for whom the ACA has made it possible to have health care coverage where previously there was none. It is not perfect, but it is a start toward including more people in the basics of health care access. If there is one element the ACA could identify as its cornerstone, it would be an emphasis on prevention as the key to controlling health care costs. And who is more perfectly suited to teach communities about the role of prevention than public health social workers? Public health social workers are on the frontlines in communities as health educators on prevention of health issues such as diabetes, tobacco use, HIV/AIDS, suicide, substance use, and more and through indirectly addressing these and other problems by advocacy for health care quality, and broader access to care. 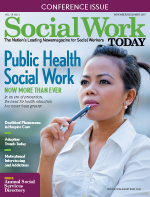 Public health social work holds a key to helping to maintain one of our most precious commodities—our health, through teaching prevention and wellness, and advocating for health care equity.